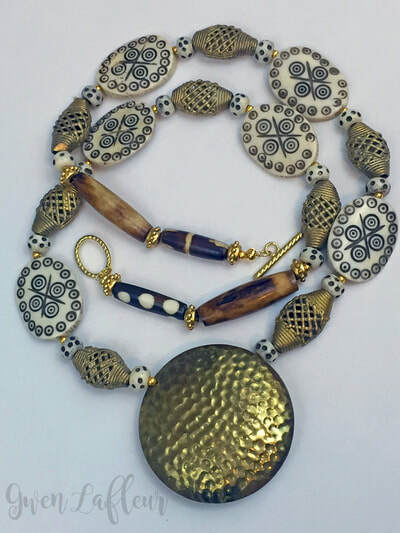 This one-of-a-kind necklace was designed around the bronze mask - it's a lost wax pendant from Africa. 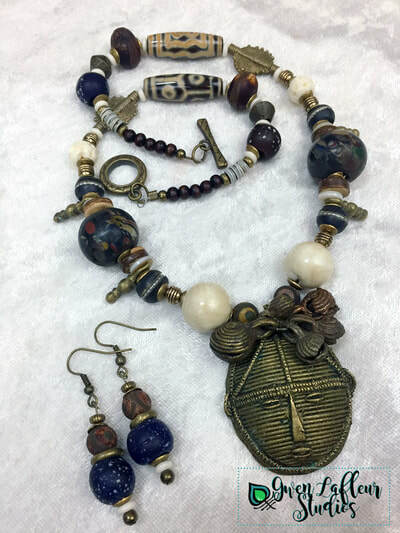 I've accented the mask with five vintage Yoruba bells and made the chain from a combination of glass, bone, shell, and semi-precious gemstone beads from Tibet, Nepal, and Africa. 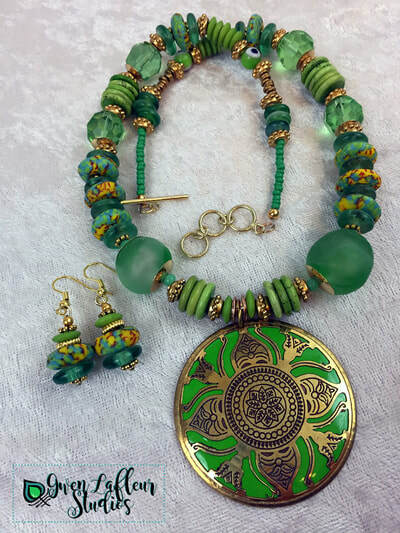 This one-of-a-kind necklace pairs a fabulous etched brass and green enamel pendant with glass beads from Africa, India, and Turkey as well as brass findings and green Magnesite semi-precious gemstone beads. This one-of-a-kind statement necklace features tribal coin pendants surrounded by glass beads from Nepal, India, Africa, and the Czech Republic. 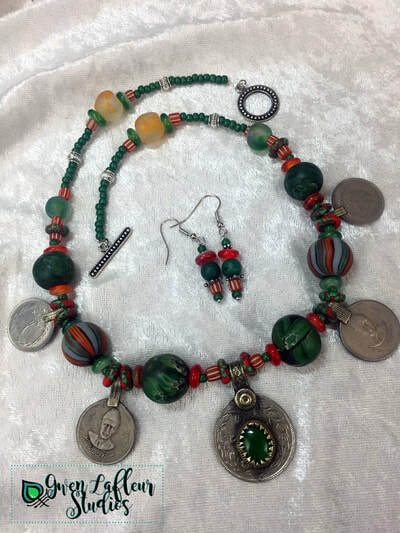 This unique tribal-inspired statement necklace and earring set was designed around the vintage Kuchi coin pendant which is set with a green glass stone. 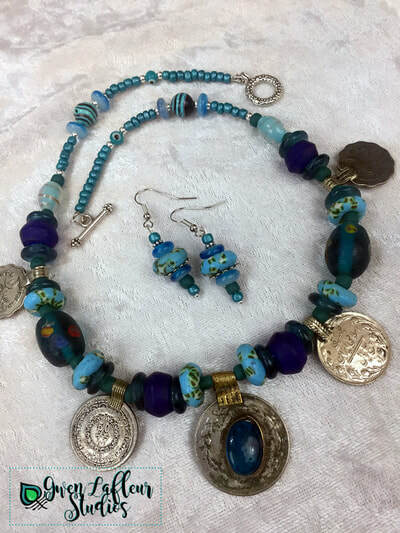 I've surrounded it with four more small Kuchi coins as well as gorgeous glass beads from Nepal, Africa, and the Czech Republic. 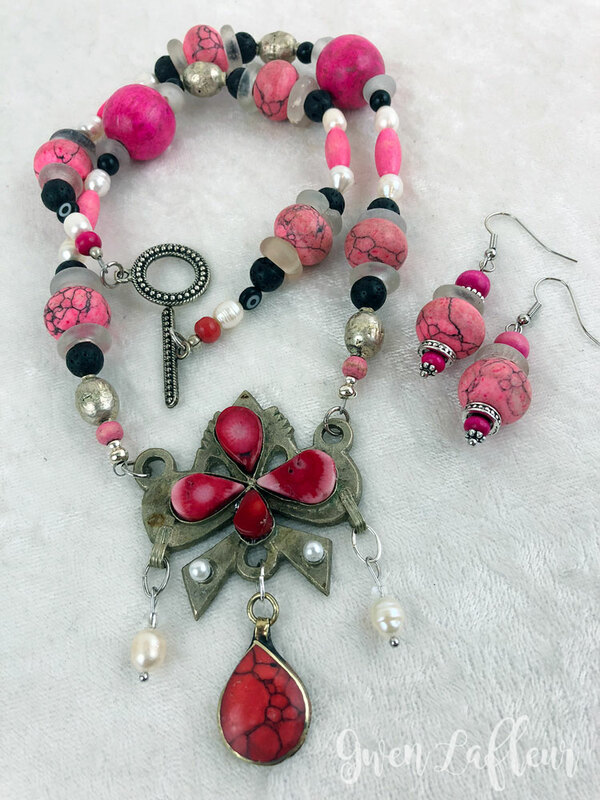 This beautiful handmade tribal-inspired necklace and earring set features a bejeweled brass Turkmen pendant with handmade African glass beads finishing off the focal section of the necklace. 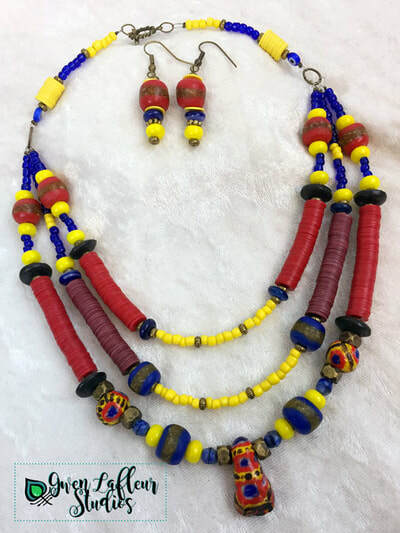 This necklace set was designed around the red, yellow, and blue Mauritanian Kiffa beads. 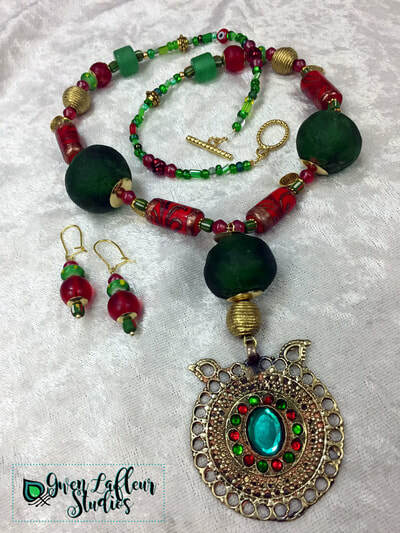 These are modern Kiffa beads (made after 1980,) and are handmade and hand-painted. 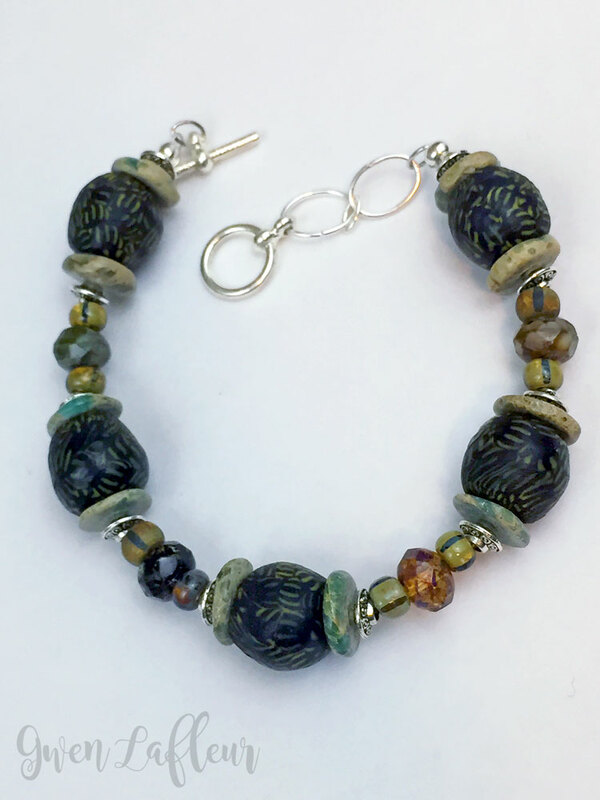 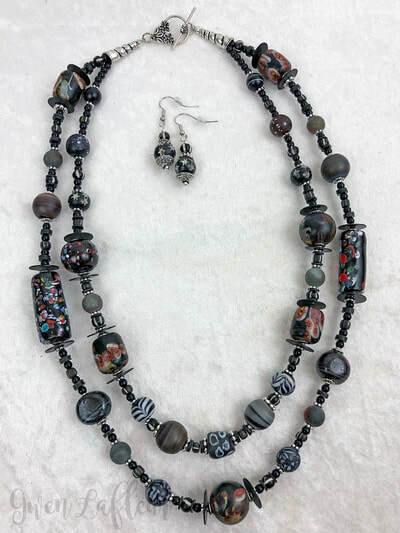 I've paired these with a few other kinds of African beads in the same color scheme along with some Indian, Turkish, and Czech glass beads, and made them into a fabulous three-tiered necklace with matching earrings. This one-of-a-kind necklace and earring set features semi-precious gemstone beads made from Aragonite and Kyanite, plus glass beads from India, Ghana, and the Czech Republic. 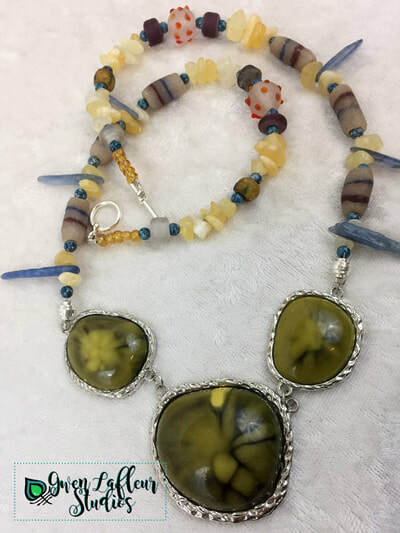 The three pendants have acrylic faux stones in a beautiful yellow-green color with dark veins; the bezels are silver colored brass.